Trump's proposal for Russia to be brought back into the fold -- which he made in Washington just before flying to Canada -- received short shrift from European members of the G7, including Britain, France and Germany on the first day of the summit. 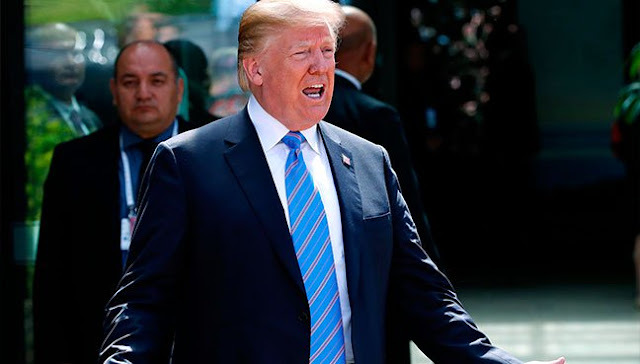 LA MALBAIE: US President Donald Trump made a fresh call Saturday for Russia to be readmitted to the G7 despite meeting widespread opposition to his proposal from fellow leaders in Canada. “I think it would be an asset to have Russia back in,” Trump told reporters shortly before flying out of the ongoing Group of Seven summit. “I think it would be good for Russia, I think it would be good for the United States, I think it would be good for all of the countries of the current G7. Trump’s proposal for Russia to be brought back into the fold — which he made in Washington just before flying to Canada — received short shrift from European members of the G7, including Britain, France and Germany on the first day of the summit. Russia was shown the door from what was then the G8 after its annexation of Crimea in 2014, widely condemned as an attack on Ukraine’s sovereignty.